This retired car is 2nd in the Hallmark Luxury Edition Series of Hallmark Kiddie Cars. Limited Edition of 24,500 pieces. Made of die-cast metal with a French bulb horn radiator ornament & nickel-plated detailing. Measures 8" long. Mint in original Hallmark box, never displayed. Certificate of Authenticity included. 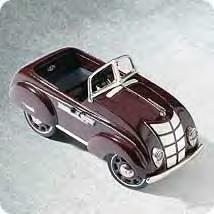 Items Similar To "1937 Steelcraft Murray Airflow Hallmark Kiddie Car Classics~Pedal..."